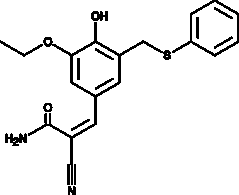 ST638 is a tyrosine kinase inhibitor (IC50 = 370 nM). It suppresses tyrosine phosphorylation induced by tumor necrosis factor-α and phorbol myristate acetate in neutrophils and by angiotensin II in cardiac fibroblasts. Cross selling for this product : ST638 There are 7 products.